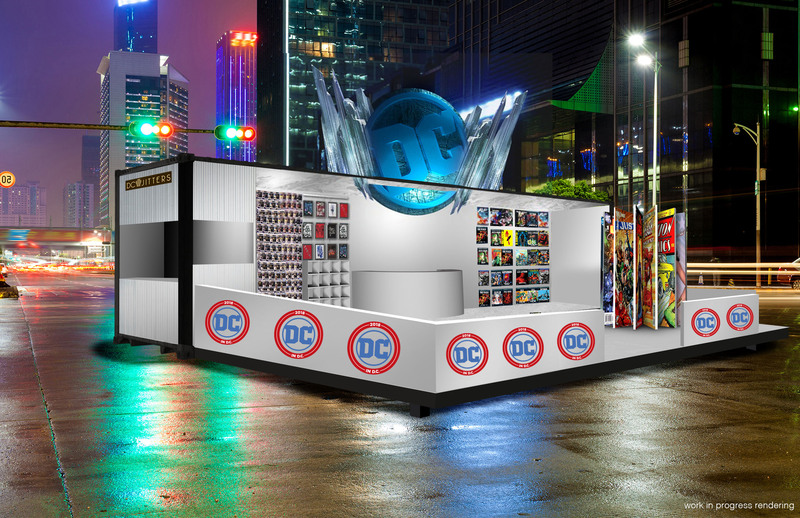 An Experiential DC Pop-Up Shop Featuring the Greatest Graphic Novels Lands in Washington, D.C. as a Companion to WBTV & DC’s Landmark Pop-Culture DC in D.C. Event; Located Adjacent to the Newseum in Washington, D.C., the Self-Contained Shop Will Be Open to the Public MLK Weekend Friday–Sunday, January 12–14, 10:00 a.m.–8:00 p.m.
DC fans in the Washington, D.C. area are in for a treat when DC’s greatest Super Heroes arrive for DC in D.C. on Martin Luther King, Jr. holiday weekend. In addition to panel discussions, screenings and more, Warner Bros. Television Group (WBTVG) and DC Entertainment are sponsoring a limited-time DC in D.C. Pop-Up Shop that will be open Friday, January 12–Sunday, January 14, 2018, in front of the Newseum. Newseum, located in the heart of Pennsylvania Avenue midway between the Capitol and the White House, will be the center of DC in D.C.’s Friday’s screening and Saturday’s panel sessions. It will also be the location of the exclusive, limited-time DC Pop-Up Shop. Featuring the world’s greatest graphic novels, the fully heated store will be situated directly in front of the Newseum building at 555 Pennsylvania Avenue NW, Washington, D.C.
Graphic Novels for Sale: Available for purchase at the Pop-Up Shop will be the Top 50 Greatest DC graphic novels of all-time. Among the many titles will be fan-favorites and cult classics such as The Death of Superman, V for Vendetta, Watchmen, The Killing Joke, Crisis on Infinite Earths and more. Also available will be a collection of books for young readers (ages 10 and above), including Teen Titans and DC Super Hero Girls. Giant Comic Panels: On both sides of the shop will be a series of two dozen 7-by-4-foot flip panels featuring Titan-sized reproductions of some of the most iconic comic-book covers in history. Not only a fantastic photo opportunity, but fans will have the ability to flip their way through the history of DC and how comics are made. There’s even a behind-the-scenes look at the production process with the “How to Build a Hero” station. 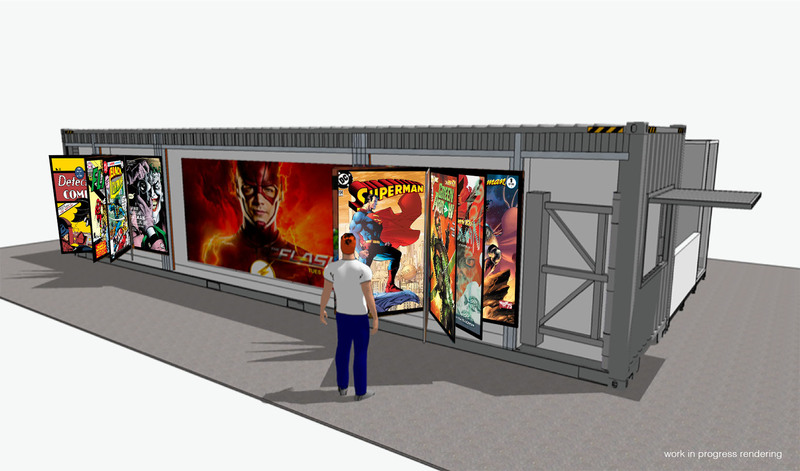 Imagine standing face-to-face with Batman, Superman, Wonder Woman and more as they look out from life-sized comic books! Both educational in their scope, they also provide a wealth of social media interaction with Instagrammable moments from the history of comics. Talent Appearances & Signings: Visiting talent from both WBTV and DC Entertainment will stop by to meet fans and sign autographs. The casts from WBTV’s Gotham and Black Lightning are currently slated to attend, alongside noted DC writers and artists including Jim Lee (Batman: Hush), Tom King (Batman, Mister Miracle) and Geoff Johns (Rebirth, Doomsday Clock). Jitters Coffee: Free coffee! Any fan of WBTV’s The Flash (Tuesdays at 8/7c on The CW) will be familiar with CC Jitters, the go-to coffee house of the extended Arrow-verse. Washington, D.C.’s DC fans will be thrilled to learn that Jitters will be open as part of the Pop-Up Shop and serving free coffee for three days (January 12–14). Warm up with a cup in the fully-heated retail space. DC Super Hero Costumes: On display, the actual costumes worn by Barry Allen aka The Flash (series star Grant Gustin) and Kara Danvers aka Supergirl (series star Melissa Benoist) in their respective WBTV series (The Flash airing Tuesdays at 8/7c and Supergirl on Mondays at 8/7c on The CW). Black Lightning Charging Station: Tying into the Saturday night world premiere of WBTV’s Black Lightning (Tuesdays at 9/8c on The CW), the Pop-Up Shop will also feature a Black Lightning charging station for visitors to “Power Up” their devices on the go. LED Megascreen: On the back side of the Pop-Up Shop, facing the Capitol Building, an enormous 15-by-9-foot LED screen will be running living art (motion graphics) of iconic comics and high-impact, super-powered video clips and trailers featuring DC Super Heroes from comics and television. Custom T-Shirts: Also available for purchase onsite will be a selection of nine exclusive DC in D.C. themed T-shirts featuring DC’s greatest Super Heroes and imagery of DC’s greatest books. Artwork will include Superman meets JFK, Superman meets Reagan, Action Comics #1, Detective Comics No. 27, Supergirl, Wonder Woman, Black Lightning, Freedom Fighters and more. Funko Figurines: DC fans will be able to purchase a curated selection of DC Funko Pop! Figures, including fan favorites from the worlds of Arrow, The Flash, Supergirl, Wonder Woman, DC’s Legends of Tomorrow, Batman, Superman and more DC heroes. Hours & Location: The DC in D.C. Pop-Up Shop will be open Friday–Sunday, January 12–14, from 10:00 a.m.–8:00 p.m. and can be found in front of the Newseum at 555 Pennsylvania Ave. NW, Washington, D.C. Taking place during the MLK holiday weekend, DC in D.C., sponsored by Warner Bros. Television and DC Entertainment, brings together stars and producers from Warner Bros. Television’s DCTV series, as well as DC comic book writers and artists, who will join invited guests from politics, government service, entertainment, business, academia and more. The event will explore the intersection of comic books, culture, entertainment and enlightenment through panel discussions that aim to illuminate the story of America and current issues through the lens of comics and Super Heroes. DC in D.C. will also feature the world premiere of WBTV’s upcoming DC series Black Lightning. Work-in-progress render of DC in D.C. Pop-Up Shop (front). Please note: render is preliminary and subject to change; design not final. (C) 2018 WBEI. All Rights Reserved. Work-in-progress render of DC in D.C. Pop-Up Shop (back). Please note: render is preliminary and subject to change; design not final. (C) 2018 WBEI. All Rights Reserved.